Look what arrived today! 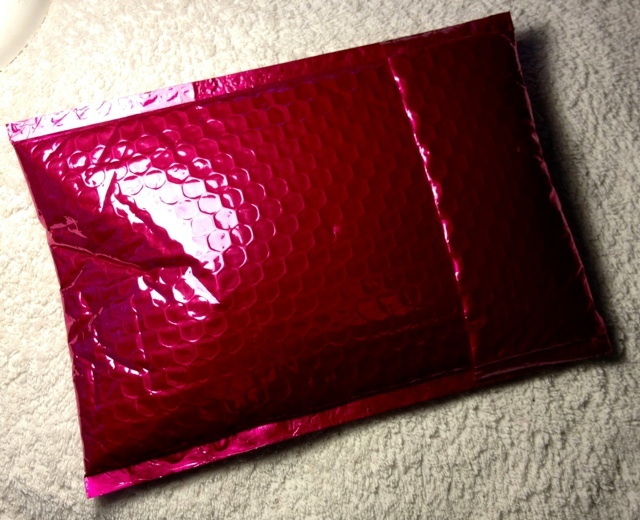 That tell tale pink envelope. My Ipsy Glam Bag is here! I was very excited to try my second Glam Bag because I was so pleased with Octobers. Novembers theme is "Party Perfect!" This months bag is a sleek leather look alike bag. 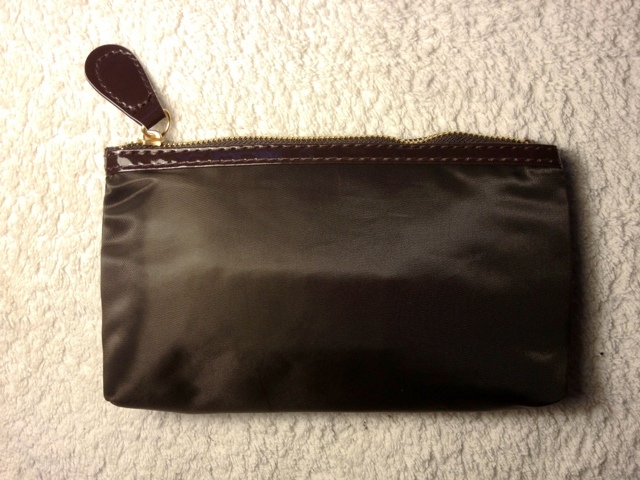 It's got a thin black material with faux brown leather on the trim and zipper pull with gold accents. The bags in these tend to look and feel slightly cheap. However for all I'm getting for a $10 subscription I don't expect much more. I'm in this for the products anyway! Inside are two cards. 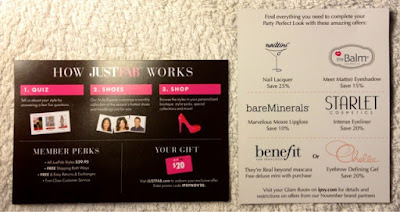 The first is a coupon for JustFab.com. 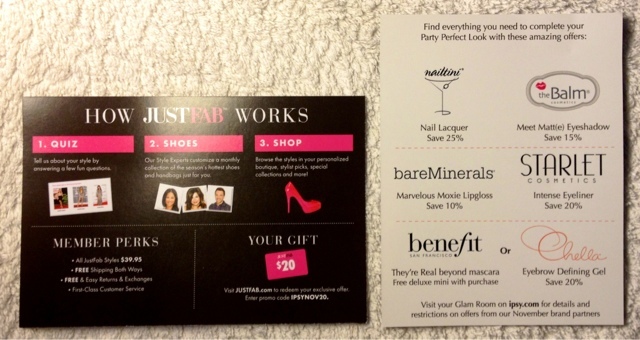 Just fab is a shoe subscription service for $39.99 a month. 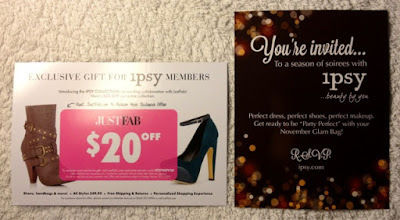 The card give you $20 off your first month by using the code IPSYNOV20. You can feel free to use the code but I'm going to sit this one out. I have more shoes than I know what to do with as it is. The second card is the party themed card. It invites to you shop the Ipsy store where Glam Bag members can get discounts on items like Nailtini, The Blam, BareMinerals, Starlet, Benefit and Chella. In my bag I received a sample size of The Blam's Meet Matt(e) eyeshadow in Matt Batali, a mini BareMinerals Marvelous Moxie Lipgloss in Dare Devil, a sample of Chellas Eyebrow Defining Gel, a full size Nailitini Nail Polish in Millionaire and a full size Starlet Chocolate Eye Pencil. The Blam eyeshadow has a cute magnetic flap to open the shadow so you could easily carry it in your purse and keep it protected. First I went for the nail polish. Duh! 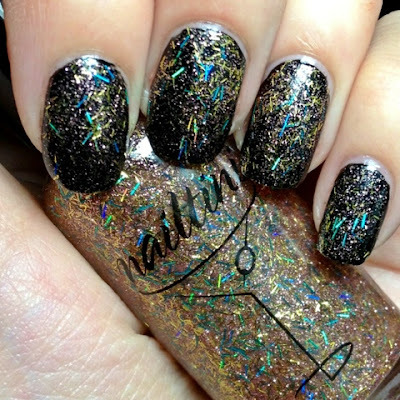 I haven't heard of Nailtini before. I applied three coats to the naked nail. It is not a full coverage glitter so it would look best layered over a base color. 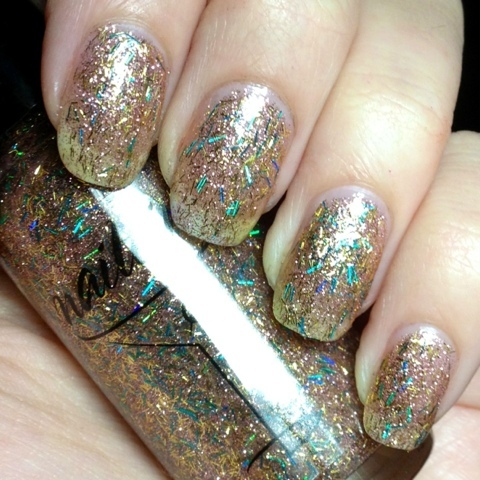 The glitters are gold and blue bars with small rose-gold micro glitters. 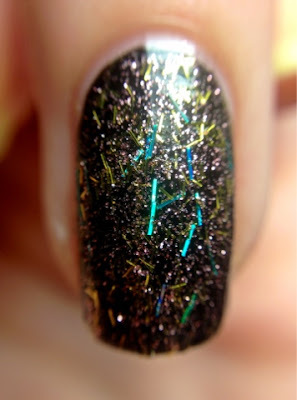 Over China Glaze Liquid Leather I was starting to feel much better about this glitter! It spread evenly and looks very pretty. Upon further exploration Nailtinis Millionaire is part of their Speakeasy Lacquer Collection and retails for $13! I only paid $10 for the whole bag so I'm pleased as punch. 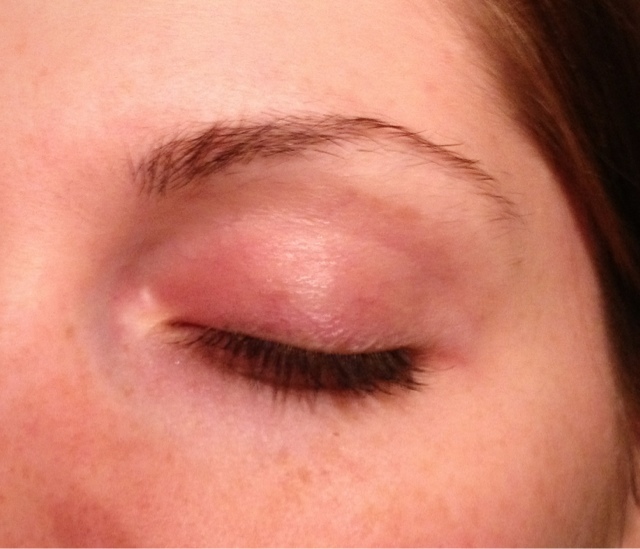 Next I wanted to play with the Chella Eyebrow Defining Gel. I've never really even heard of eyebrow gel before (this is why I love these tester bags) so I was excited to give it a try. 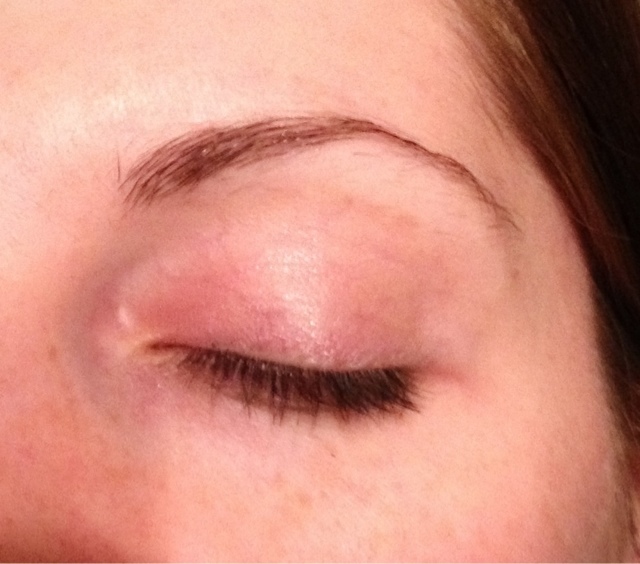 Here is my natural brow after a long day at work. Can you tell I was a little frazzled today? And right below with one swipe of the defining gel! I did not put anything in place or play around, I just did one brush with the wand and my brow was instantly snapped into place. The gel holds the brow for lasting perfection. I am very pleased with this sample! I didn't realize my brows could get so crazy. I will definitely use this gel but I probably won't buy a full size product. While it is awesome it just feels slightly unnessesary to me when I could push my brows into place with my fingers. Chella Brown Defining Gel retails for $18 for a full size product. This sample size retails for $45 as part of a 4 product brow set but it isn't sold alone so I can put the value of the sample at about $11ish. Another awesome value! 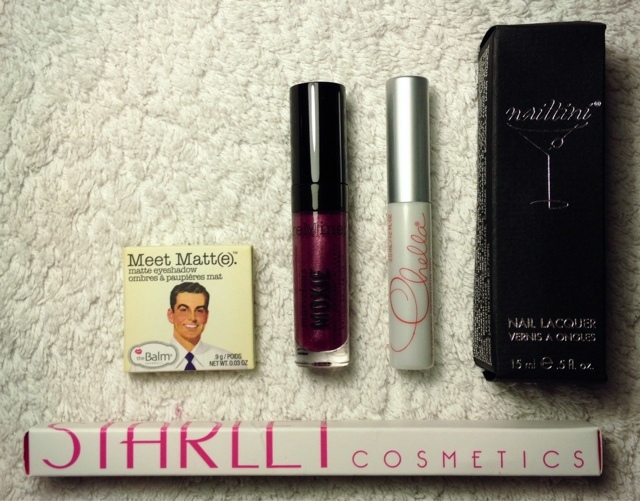 Next up are my eye and lip products. 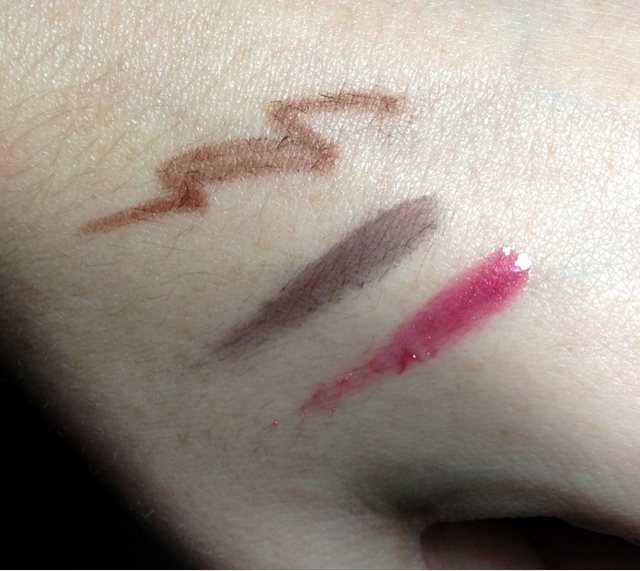 I did a quick swipe of each product on my hand. 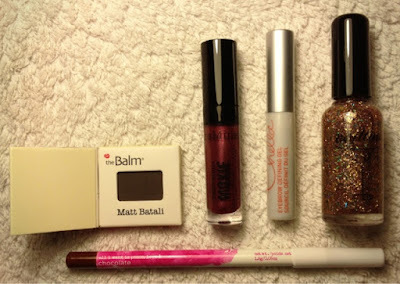 First is the Starlet Chocolate Eye Pencil (two lines drawn), then The Blam Matt Batali Eyeshadow and finally BareMinerals Marvelous Moxie Dare Devil Lipgloss. I like the eye products for my complexion but the lipgloss is a little dark and dramatic for me. This lip gloss is a deep sparkling blackberry. And wowwwww does it tingle! It was a refreshing and plumping feeling which I definitely felt worked to pucker my lips. I just wish my shade wasn't so deep so it was something I could wear more often. Looking at the picture I actually feel it looks nice...maybe it's just me and my not-used-to deep colors craziness. The full size lipgloss retails for $18. Since this is half the size I'll put the value at $9. 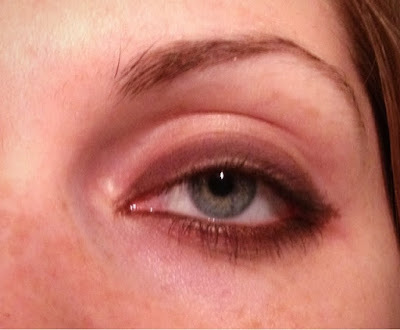 The Balm's Meet Matt(e) Eyeshadow in Matt Batali is lovely! It's a deep burgundy, eggplant color. I want to say it applies creamy but it's matte! 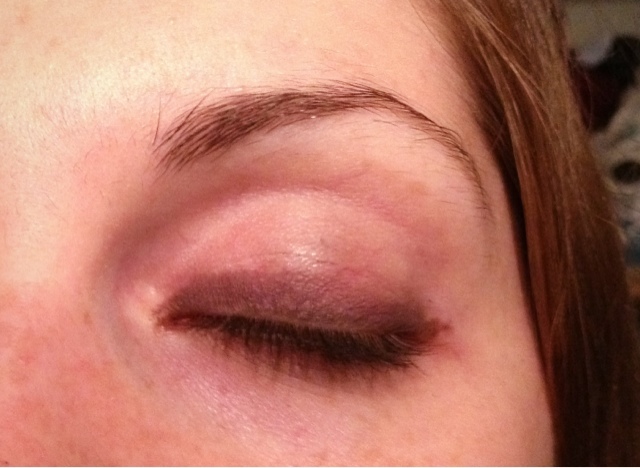 It smooths on the eyelid perfectly though. Matt Batali is part of The Blams Matte Eyeshadow Palette which retails for $34.50 and includes 9 colors plus an applicator so we'll put the value of the single eyeshadow at around $3. Altogether I am again super pleased with my Ipsy Glam Bag! Overall the retail value of all these products is around $47 and I paid $10. I got to try out some really cool products I wouldn't have been able to try otherwise.